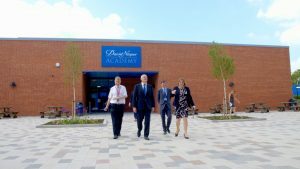 The David Nieper Academy in Alfreton, Derbyshire has announced plans to create a memorial in honour of former Headmaster Wilfred Dawes O.B.E. and Alderman William Mortimer Wilson, local businessman, lawyer and chairman of the county education committee, who founded the school in 1939. As the first, and the School’s longest serving Headmaster, Mr Dawes was awarded the O.B.E. in 1959 for services to Education. He retired in 1974. 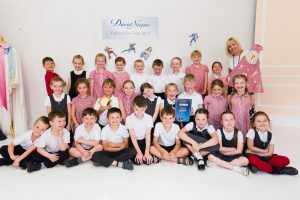 The David Nieper Academy, formerly Alfreton Grange Arts College and Mortimer Wilson School has been at the very heart of the Alfreton community for decades where often generations of the same family have attended. David Nieper Academy governors, along with some of the school’s former pupils plan to create tributes within the new school campus to honour two of the individuals that have helped shape the school’s history, and contributed so much to the community and educating Alfreton’s school children over the years. The final location and nature of the memorial is still to be confirmed, however plans so far include a Wilfred Dawes memorial garden to create a living remembrance, and the official naming of the new school’s sports hall as the ‘Mortimer Wilson Sport Hall’ with a commemorative plaque and an annual sports’ day fundraising event. Also under discussion is the provision of a cup or trophy, awarded to pupils annually and large enough for the names of the recipients to be engraved. 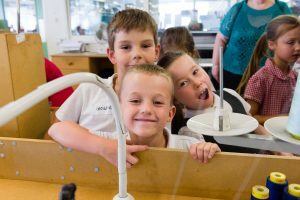 The school is keen to work with the local historical society to create a permanent exhibition within the school to provide information about the work and lives of Alderman Mortimer Wilson (1865–1941) and Wilfred Dawes O.B.E. (1909–1986). 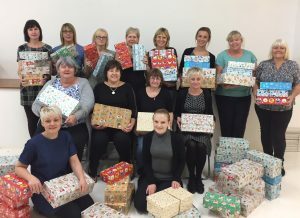 Christmas has come early at David Nieper in Alfreton, as staff have been busy collecting goodies, packing and gift wrapping over 80 Christmas boxes to donate to the Samaritan’s Purse Operation Christmas Child appeal. The Samaritan’s Purse is an international relief and development organisation, every year they run an appeal to help brighten Christmas time for the children most in need around the world, by delivering shoe boxes full of toys and other gifts. This is the 3rd year that David Nieper has donated to the charity through the staff collection of toys, school supplies, toiletries, confectionary and cards, and also funding the transport of the shoe boxes to children all around the world in Africa, Eastern Europe, Asia and closer to home. Derbyshire fashion house David Nieper has this season launched its first collection dedicated exclusively to luxury knitwear. 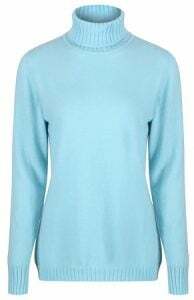 The company has been making knitwear in Derbyshire for over 6 years as part of their luxury day wear range. 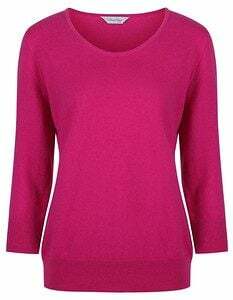 Growing popularity and demand for British knitwear has prompted them to create a brand new exclusive knitwear collection, offering more classic and contemporary styles and in a wider selection of colours – from soft neutrals to vibrant colour blocks. 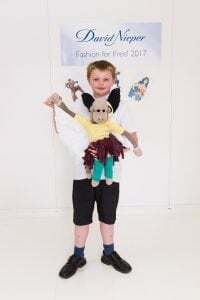 In 2011, HRH Princess Anne officially switched on the first knitwear machines in Derbyshire, putting David Nieper at the forefront of the revival of the British knitwear industry. The launch of David Nieper’s knitwear range coincided with the fashion industry’s move away from mass produced, synthetic products in favour of authentic knitwear in natural fibres. This, combined with the famous ‘Sheep pasture in Saville Row’ campaign by UK Campaign for Wool, a movement championing and extolling the benefits of natural yarns, has significantly boosted the UK’s knitwear industry this decade, and as a designer making authentic knitwear from first sketch to final stitch in the UK, David Nieper has never looked back. The current knitwear collection features over 70 different styles in sizes 10-24, all crafted by a team of 12 specialists. Luxury Lambswool, Merino and Cashmere sourced from sustainable stocks are the staple yarns of the knitwear collection, which are skillfully spun into a range of contemporary designs and classic styles. Where possible the design team works with local suppliers including our Lambswool and Geelongora yarns which are sourced from Yorkshire. David Nieper’s new Autumn/Winter collection is available online from September; each garment is made from first sketch to final stitch in Derbyshire using the highest quality fabrics and always cut to perfection. Derbyshire students have an exciting new opportunity to kick start their career by joining the new David Nieper Academy Sixth Form Business and Enterprise Centre opening in Alfreton this September. This will be the only 16+ education facility of its kind dedicated to business studies in the area, and is an ideal option for young people wanting to pursue careers in the dynamic world of business. Students will experience a learning environment that encourages and develops independent thought, self-discipline, motivation and confidence. The new sixth form will initially offer the intermediate BTEC Level 2 First Diploma in Business (equivalent to 4 GCSEs A*-C) along with GCSE Math’s and English, and will in the future offer the advanced BTEC Level 3 National Extended Diploma in Business (equivalent to 3 A-Levels). 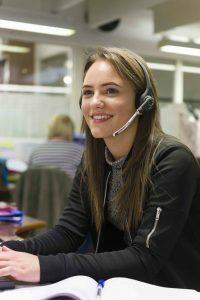 “We are delighted to be able to offer our local young people the option to take a uniquely business focused qualification, which has the potential to open doors in a wide variety of career paths from marketing and HR, to banking, law, retail, insurance and logistics or careers outside of business. The David Nieper Academy is privileged to have some of Derbyshire’s leading businesses developing the curriculum. 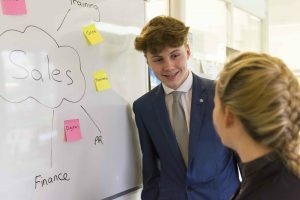 Sixth form students will be matched with both the Academy’s employer partners and other local employers for work placements to enhance students’ future job prospects, as well as enabling them to move onto apprenticeships and further education. Take the first step to securing your future with a business qualification and contact us today on 01773 832331 or mail [email protected] to arrange a visit and request your prospectus. 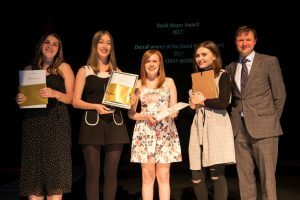 ‘Best of British’ was the theme that inspired the fashion design and textile students at the University of Derby taking part in this year’s prestigious David Nieper scholarship. 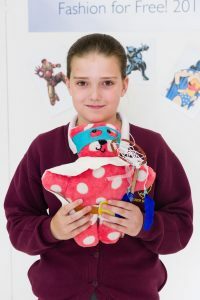 Emily Webb took first prize in the textile design category and Hannah Coles was awarded first prize in fashion design. Fellow students Jessica Midgley, Emma Giles and Kate Myerscough were all presented with runner-up places. Over 100 students competed in the David Nieper scholarship which is an annual award currently in its 5th year, open exclusively to 2nd year BA textiles and BA fashion design students. The prize money on the evening totaled £1600 towards financial support for the student’s final year of study. 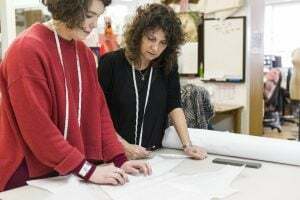 As part of their mandatory portfolio project, students were briefed to create a sample collection of four garments one each for nightwear, evening wear, day wear and travel wear designed specifically for the older woman, a market often forgotten by the high street. This year students were asked to base their collections on British location and culture. The brief which really captured their imagination and inspired some fantastic design work based on iconic British locations from Yorkshire to Brighton, Edinburgh and Bath. 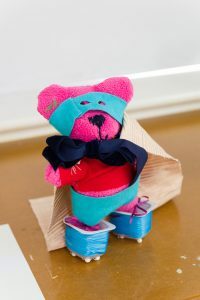 Winner of the textiles category Emily Webb created a spectacular collection, drawing inspiration from the traditional English seaside destination of Brighton, capturing the bright colours of the pretty beach huts and hues of the scenic South coast. “I am thrilled with my award, the competition was tough in our year and I have enjoyed the whole experience. 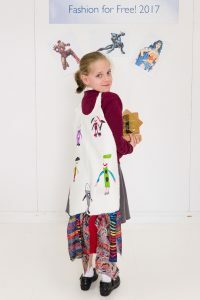 The brief allowed us to be really creative and I based my designs on a typical British summer’s days at the seaside and created two hand printed fabrics, one digital and one knitted design. “The quality of work produced by our fashion and textile design students this year has been exceptional and our showcase is stronger than ever before. “The graduate fashion show is a significant example of where the University is offering real-world experience to its students. Seeing their work on the catwalk, worn by professional models, is an amazing feeling for our students and a real celebration of their success. Photograph From left to right…..Hannah Coles (BA Fashion), Emily Webb (BA Textiles), Emily Giles (BA Fashion) and Jessica Midgley (BA Textiles) then Christopher Nieper, Managing Director, David Nieper. 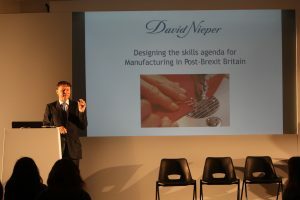 Speaking at the Make it British ‘Meet the Manufacturer’ event in London, Christopher Nieper, Managing Director of luxury clothing business David Nieper Ltd announced that the Derbyshire fashion house has become a national trailblazer for the government’s apprenticeship drive in fashion and textiles. The industry’s vocational qualifications including NVQs and BTECs, are being replaced by a new system where employers take the lead and set the criteria against which apprentices must develop their skills and benchmark success. 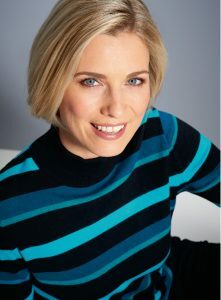 David Nieper has a 55 year heritage of making fine British fashion, with an extensive collection created every season including luxury knitwear, day wear, swimwear and night wear making them an ideal business to determine the skills requirement for the sector, and set the National Apprenticeship Standard. 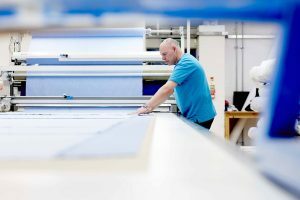 The family business is currently working with Chesterfield College and the New Economy in Manchester to set the standard across three specialist job roles including; sewing machinist, pattern cutter and garment technologist. Once set, all fashion and textiles apprentices in the UK, training for these roles will be assessed against the new trailblazer standard. The National Apprenticeship Standard officially sets out the competencies an apprentice must display by job role, and provide a point of reference on their progression. Apprentices must demonstrate the appropriate level of skills, knowledge and behaviours appropriate to each specific job role to gain their qualification. As one of the few fashion designers that have always produced in the UK, David Nieper has prioritised training to allow specialist skills to be passed from experienced staff onto the young generation and apprentices have played vital role in this. So, when the government announced a change in the way UK apprenticeships were to be funded through the apprenticeship levy, David Nieper Ltd saw an opportunity to get the most out of the scheme and take control of developing of apprenticeships that worked better for business. Rt Hon Iain Duncan Smith MP (former leader of the Conservative party and leader of the opposition) and Andy Cook, Chief Executive Centre for Social Justice visited the new David Nieper Academy in Alfreton, Derbyshire to see how the David Nieper fashion house is uniquely putting social justice at the heart of its business plan. David Nieper Ltd has been one of Alfreton’s largest employers for 55 years and one of the few British fashion houses that has never taken production overseas, but has instead prioritised creating jobs for local people and more recently prioritised educating local children. 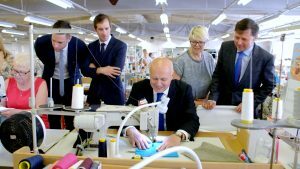 By becoming the first UK fashion business to sponsor a school and investing significantly in broadening skills across the community, the business is tackling both education failure and worklessness, two of the most detrimental social issues identified by CSJ in their ‘Breakthrough Britain’ report, making this visit from Iain Duncan Smith and Andy Cook especially poignant. 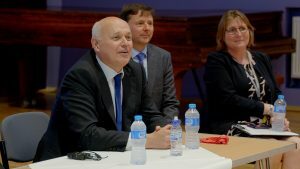 The Centre for Social Justice (CSJ) was established as an independent think-tank in 2004 to put social justice at the heart of British politics and make policy recommendations to tackle the root causes of poverty. The CSJ is best known for its major Breakthrough Britain reports which identified 5 pathways to poverty – family breakdown, educational failure, worklessness and dependency, addiction and serious person debt. “The David Nieper Academy is exemplary in the way it has tackled the skills shortage in its local area by training up young people in readiness for employment. “Not only does the British manufacturing industry benefit, people living in the community have the opportunity to gain the skills they need to get a job and progress with their career. “It is well known the best route out of poverty is through work. Work also provides a regular routine, a means of interaction with a community, a stake in society and a sense of purpose. 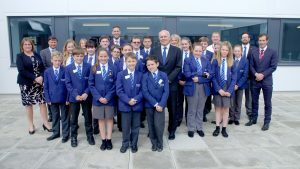 Christopher Nieper, Managing Director of David Nieper Ltd and the founder of the David Nieper Education Trust, believes the only way to secure the future of the business and the town’s economic future is to invest in skills. Alfreton is a former coal mining town and within the ‘travel to work’ area of Derby, which has been identified by the Government as a social mobility cold spot – i.e. an area with a higher concentration of low paid jobs, low skilled jobs and lower school attainment standards. The David Nieper Education Trust aims to develop the methodology to turn around a persistently underperforming secondary school (historically in the bottom two percent for attainment) whilst delivering career ready, employable young people for jobs, apprenticeship and further education. The ultimate goal is to ensure that young people in Alfreton have as much opportunity to progress in life as those living in other parts of the UK. “We are delighted to welcome Iain Duncan Smith and Andy Cook here today, and appreciate their recognition of our endeavours to help secure the future of Alfreton through education and skills. All young people regardless of background should be capable of living fulfilling and productive lives – we are hoping to help them achieve this through our work at the school. David Nieper works with education at every level, supporting primary schools, secondary education at the David Nieper Academy (built for 850 pupils) , sponsoring university bursaries, chairing the government’s Trailblazer for the National Apprenticeship standards in sewing and garment technology and their own in-house sewing school. 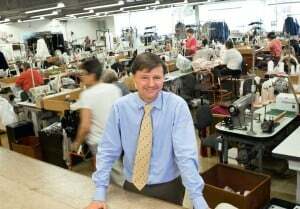 Derbyshire fashion house David Nieper, one of the UK’s leading fashion manufacturers today welcomed the formal trigger of Article 50 and the long awaited turning of the key in the ignition of British business. The fashion house which celebrated 55 years in business last year, exports one third of products to France, Germany and Holland and has been trading within Europe’s markets since long before the emergence of EU administration. “Article 50 is a shot of adrenalin for British manufacturing and a catalyst to export for our great trading nation. British design and British made products are revered the world over, so let’s see this as an opportunity and not a hazard. The trend of manufacturing overseas which started in the seventies and has almost decimated the fashion production industry in the UK. In 1977 over 900,000 people were employed in fashion manufacturing in the UK, this figure has fallen to just 34,000, a 96 percent reduction. More broadly within the manufacturing industry, overseas production has resulted in a downturn in UK manufacturing across all industries, a rise unemployment, the affliction of an unskilled workforce and a downturn in export. This downward spiral has contributed to the UK’s substantial trade deficit, an increase in borrowing and national debt. The Government’s new ten pillar modern industrial strategy is a useful start on the road to recovery, it addresses the skills shortage and puts onus on both education and the business world to work more closely together to ensure the market is up to the challenge. 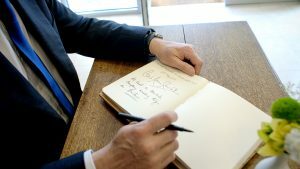 Once the strategy comes into fruition a virtuous trade circle will be allowed to develop – more manufacturing means more jobs, more skills, more exports and as a consequence less trade deficit, less borrowing and less debt. Since the Brexit vote, productivity at the Derbyshire fashion house has increased, boosted by the lower value of GBP. Sales in the last quarter of 2016 were up by 19% in UK and 16% in the EU. “The opportunity for manufacturers is very real and so too is the challenge, the new industrial strategy is a much more sustainable model. At David Nieper we have already taken the first steps and committed to increasing our own skills to meet demand by increasing the size of our sewing school by 150% by end of 2019.